Those of you who follow me on Facebook know that in addition to commenting on the Animal Planet program “Finding Bigfoot” every chance I get, I’ve been immersed in racing research recently. 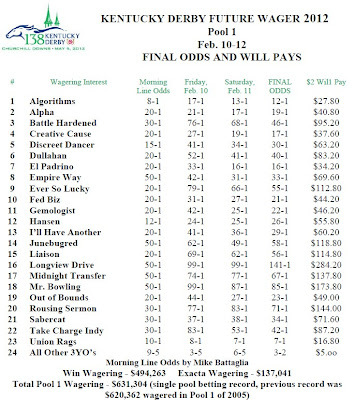 My latest pet project concerns turn times and their effect on the outcome of thoroughbred races. Generally speaking, the “turn time” of a race is obtained by subtracting the first fraction (recorded at the 1/4-mile mark in sprints, 1/2-mile mark in routes) from the second call (1/2-mile mark in sprints, 3/4-mile mark in routes). The term is derived from the fact that, for the most part, this segment of time is measured as the horses round the turn for home — often, when the real running begins. Tom Brohamer, author of "Modern Pace Handicapping" once said: “The ability to handle the turn in an efficient manner is a characteristic of a fit horse.” To see if this was true, I developed a Turn Time Ration (TTR), which is similar to my early and late speed rations (ESRs and LSRs), except that it focuses on the middle, or “hidden” (as some handicappers have called it), portion of a race. TTR less than 0= Good. TTR greater than 3= Poor. Now here’s the amazing part: Nearly half (17) of the 37 Kentucky Derby winners since 1975 made their final prep in a race that featured a “good” TTR (less than zero). What’s more, 35 of 37 Derby champions came out of a race with at least an “average” TTR; only two exited a race with a “poor” TTR. If one were to add/subtract lengths gained/lost from the first to second calls, the stats get even better, as only Sunny’s Halo won the Run for the Roses following a poor TTR in his final prep (4.06 in the Arkansas Derby on April 16, 1983). Ironically, Sunny’s Halo also had improving LSRs, which has been a potent angle on the first Saturday in May… but that’s a subject for another day. *Recorded at a bullring (track with a circumference of less than one mile). Count Turf is a good example of what to look for in a Kentucky Derby contender. Notice that at the old Jamaica Race Course on April 14, 1951, he zoomed from eighth-place out by 11 lengths at the first call to second, out by 2 ½, at the second call. Although internal fractions were not listed at that time, one can imagine what kind of “turn time” such a move would have produced. Count Turf won the 77th Kentucky Derby as a member of the mutuel field and paid $31.20. 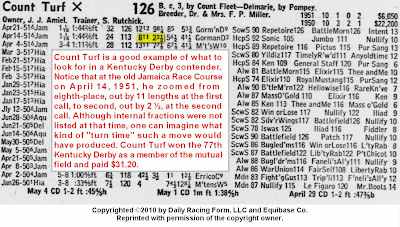 Great info Derek, also note how many starts Count Turf had before his Derby win. Will we ever see anything like that again? I know, I know, horses aren't tough anymore, we've bred for speed, etc. etc. etc. Tell that to Black Caviar down in AU as the undefeated mare prepares for her 3rd sprint in 21 days. Ha, ha. 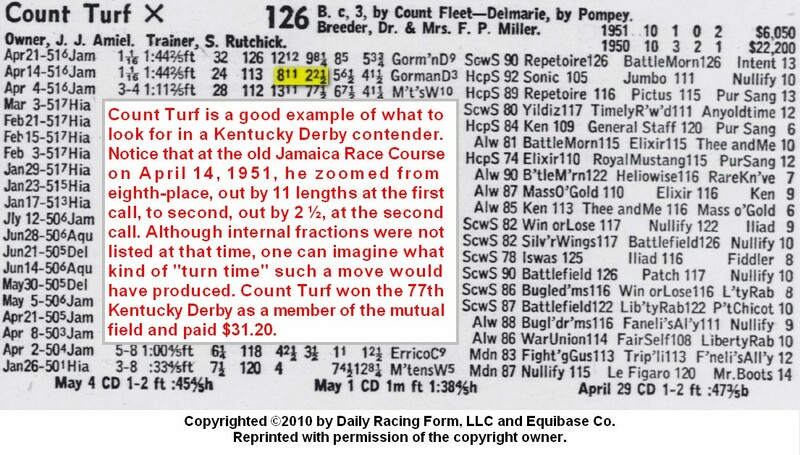 I noticed the number and spacing of Count Turf's races immediately -- and he was typical of early Derby winners in that regard. 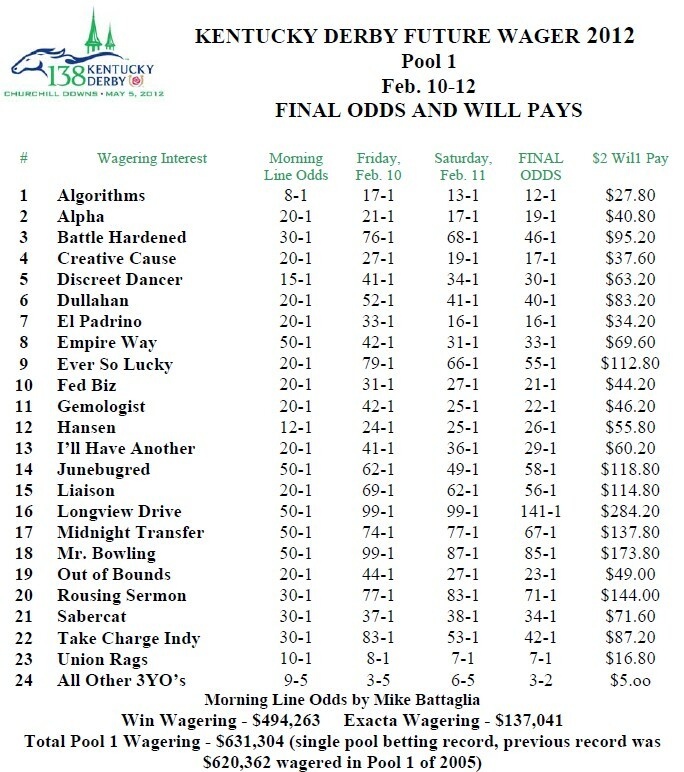 Is Union Rags a monster for you not to include him here?